Synopsis: The 2015 Meal Planning book is a place to plan and organize all of your meal planning including Breakfast, Lunch and Dinner. Don't guess what's for the next meal. Write your meal plan in advance on blank pages and make a grocery shopping list for stressfree meal time. Do you have little time to plan healthy meals or you just like to be organized? Then you'll love your 2015 Meal Planning book. - 52 weeks for a full year of menu planning - Plenty space to write daily menu for breakfast, lunch and dinner - Full page grocery shopping list for each week of menus - Large 8.5" x 11" pages with plenty room to write Don't struggle with last minute decisions for meals. 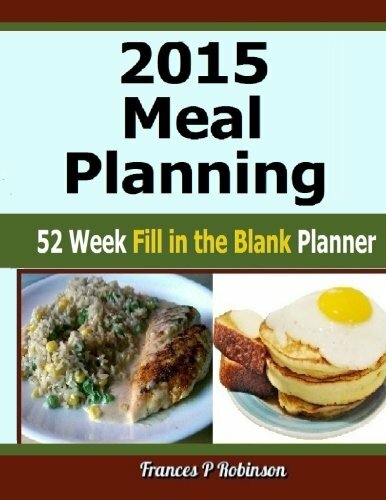 The 2015 Meal Planning book will simplify your meal planning and give you more time for yourself or other obligations.